Arco Decorations transform newly purchased offices in Lichfield to create a real life prototype of the quality and service they provide for clients. 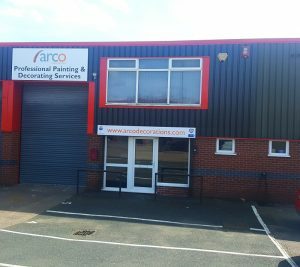 Brand new Arco Offices in Lichfield receive an in-house renovation by our painting and decorating experts. With our on-going success, particularly over the past 12 months, and our consequent business expansion, we decided to invest in an office base of our own in Lichfield that would stand as a real life prototype to the quality and service we provide for clients and our industry. Prior to Arco taking over the property it had been used largely for storage purposes for a Christmas decorations company. There was very little office space and we felt that the arrangement of the facilities wasn’t appropriate for what we were trying to achieve. We maximised our office space by ripping out the old partitions and building new ones, designing a brand new layout with a functional and spacious office for our staff. We fitted and decorated a new kitchen, laid brand new flooring and installed a suspended ceiling. We created a feature wall for the main part of the office using vinyl wall-covering. With vinyl we are able to create a precise and professional finish that standard wallpaper rarely achieves. With providers like Muraspec https://www.muraspec.com, you can choose any print design that you want, combining colour, style and texture. Wallpaper shrinks when it dries, often leaving a less definitive and precise finish. Vinyl on the other hand, is fitted with an overlap and then spliced to gain a razor sharp edge – practically invisible, therefore giving you a flawless finish. We used the highest quality vinyl wall fixtures and incorporated company branding to our decor to emphasise the importance of brand presence in property aesthetics. Contemporary greys combined with our brand colours created a professional finish that we felt adequately represented our name. Arco decided to treat the new company headquarters as an opportunity to showcase our skills, invite clients for a cuppa and discuss their ambitions for a successful business property of their own. It was really important to us that it was right, and it was even more important to us that we did as much of it ourselves as we could. The only thing we didn’t risk doing ourselves were the electrics and the plumbing… Risky business for a bunch of blokes who are in business for being handy with a paintbrush! Come and see us at the new offices in Lichfield to see our handy work for yourself and for a consultation regarding your vision for your own domestic or commercial property! Contact information and directions to our office are available here.